They all started illegally, but today, some of these street painters and other graffiti artists have become world famous and are selling their work. They used to be despised. They are now successful. No more bomb sketches, hazardous tags, and simple signatures for this new kind of artists: the urban art is changing sides. For nearly thirty years, the self-taught painters have striven to imagine more and more techniques to improve their work of art and today, their talent is finally being recognized. A real craze has been created for this new art: never have we seen so many artists, walls are becoming collector’s items. With different colours and styles, every creator is lending an identity to a whole neighbourhood; streets are becoming real art galleries. Some street painters are now widely known and cherished, such as Thoma Vuille alias M. Chat. This very popular French-Swiss artist has been vilified and fined by the RATP for drawing on the walls of the Parisian subway in early September. The mayor of the 13th arrondissement immediately supported him by launching a petition. 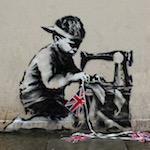 In London, numerous visits are organised to tour the various streets where Banksy, the most famous of them all, has his art pieces. The walls are not cleaned anymore, they are honoured. Shoreditch is one of the most interesting places in the English capital when it comes to street art: an area in which we can find "clues" left by the street artists. This has become a fascination for some and many would be artists are trying it out and if a few are greatly appreciated, the others should perhaps be discouraged. We can sometimes observe strange things appearing on the walls of London. Real talent is unfortunately not given to everyone. 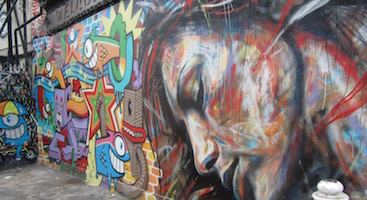 To book a street art tour in London: http://streetartlondon.co.uk/tours/. The price is between 12 and 15£.